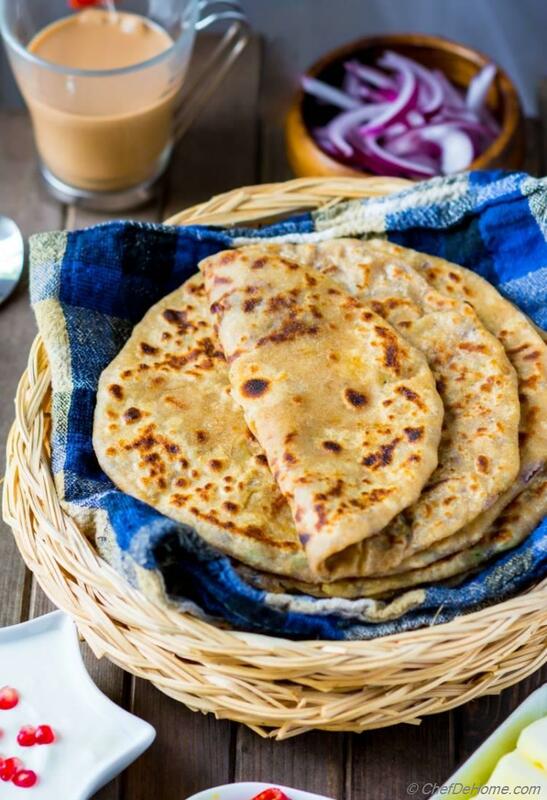 Aloo Paratha is one of the most loved Punjabi Indian breakfast bread which is cooked and enjoyed in all regions of India. In India, even street vendors sell big-size loaded potato parathas and serving with salted butter or dahi (yogurt) on the side. There are many variations of stuffed potato paratha recipe. Along with boiled mashed potatoes, herbs, and spices, variations have minced red onions, green onions, green peas, paneer, fenugreek leaves (methi) and more... Few of my family favorites are potatoes with red onions and potatoes with green peas parathas. There is no family/holiday gathering in Northern India without a potato paratha breakfast on the menu. When family is around, kitchen will filled with aroma of potatoes boiling on the stove. Ever one knows aloo paratha is on the breakfast menu! When I joined Vishal after marriage I was relatively new to cooking.. and so was Vishal. But, some how he made aloo paratha much better than I did. I always wondered after eating it.. why does his version taste so good. In-fact, sometime I stood in kitchen and gave him ingredients to make potato stuffing. Later I rolled and seared the parathas myself.. but still his version would taste batter than mine. Mystery, really!! So, one day I decided to get-over my aloo paratha recipe dilemmas! :) I called my mom and asked for recipe in detail... asked for small things which I might have been missing. Not just that, I also observed Vishal closely when he made potato stuffing next time. Finally, I knew what was I missing?! I was going not-so-easy with ingredients and that's key to making authentic Punjabi Aloo Paratha! Go for big bold flavors or don't make it. 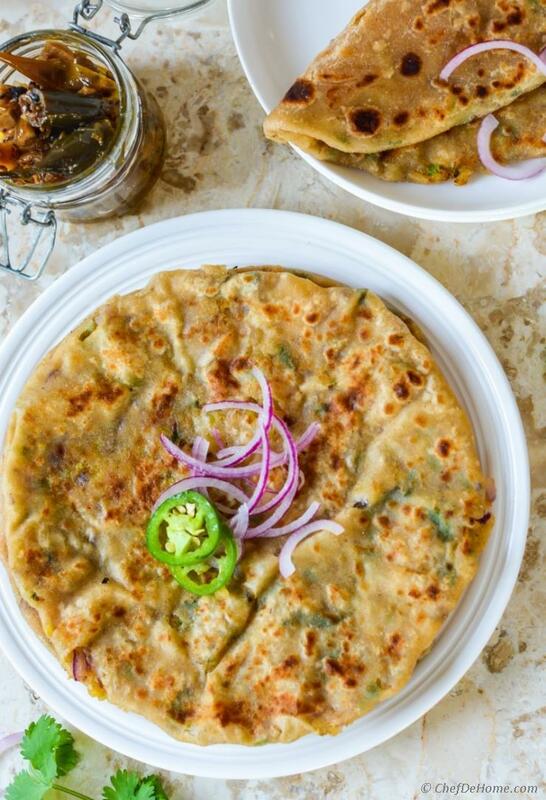 Aloo paratha needs very simple ingredients - boiled potatoes, minced ginger and green chili, fine chopped red onion, spices, salt, and chopped fresh cilantro leaves. To bring out the flavor of mashed boiled potatoes, it is important to add generous amount of red onion, cilantro, spices, even ginger and green chili! 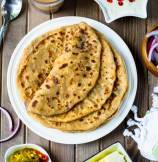 Do this, and your family will forget store-bought paratha. So, let's learn how to make potato paratha which I went extra-mile to finally make right! I boil potatoes and grate them for even stuffing. I learned if I just mash the potatoes with hand or fork, that leaves lumps in paratha which does not look good and does not even taste that good. So, no chunky potatoes in my aloo paratha. For making stuffing, I add 1/2 large red onion (fine chopped for even mixing), fine minced green chili, ginger, and cilantro to grated potatoes. I add generous amount of spices and make sure taste after missing to adjust salt. You would not want under-seasoned potatoes for aloo paratha. I also add little bit of salt in potato paratha dough. This makes the paratha more evenly seasoned than a no-salt dough with salty filling. It is important to let the dough rest for 5-10 minutes after kneading. In this time, dough relaxes. Relaxed dough gives very good moist texture to paratha. 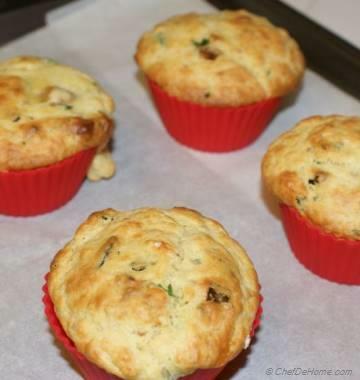 Both, dough and potato stuffing can be made a day ahead and refrigerated in air-tight container. For cooking, I stuff each a piece of dough with small tennis ball size stuffing and, then roll it gently on a flour dusted board. Often, I sear paratha with little bit of oil applied on both sides. This prevents paratha from drying out. If I' not in mood to use oil for frying paratha... I just sear the paratha without oil and serve it with little spoonful of butter. 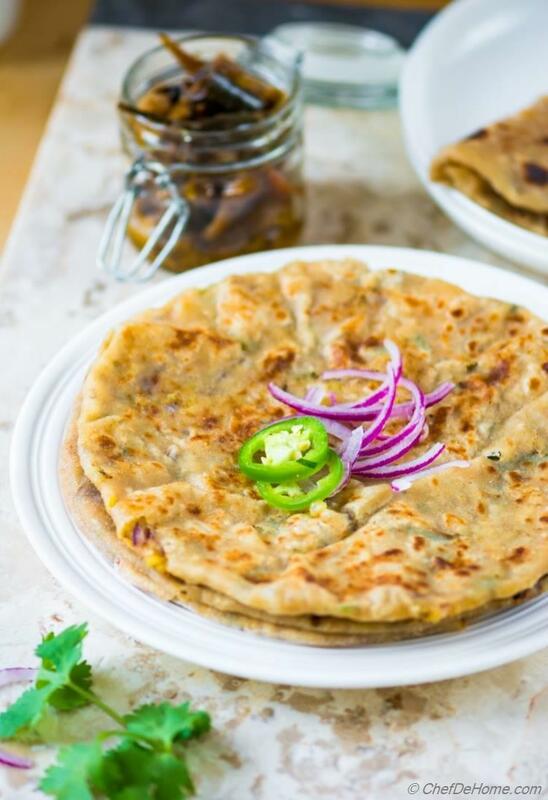 So friends, today I shared with you how can you make an amazingly delicious aloo ka paratha at home! Try it this weekend and impress your guests! Just make sure to go big and bold with the flavors as that is the key to make scrumptious aloo paratha. Total Time 40 minutes Prep Time 20 minutes Cook Time 20 minutes Difficulty Easy Yields 6-7 Aloo Paratha Serves 4 Notes No. of servings depends on serving size. 1. Mix Paratha Dough ingredients in a medium bowl, mix to bring dough together. 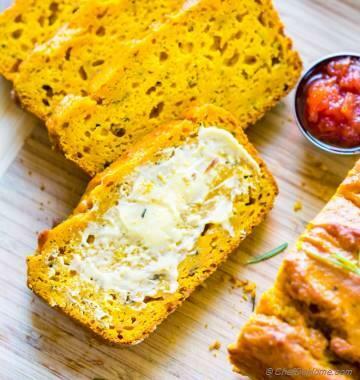 Knead for 1-2 minutes, cover and set aside. 2. Potatoes Stuffing - In a small bowl, add grated boiled potatoes (aloo) onion, ginger, green chili, cilantro, and all other seasonings. Mix well with spoon or fork. Taste and adjust salt and chili per preference. Set aside. 3. Heat an iron skillet or flat bottom heavy skillet. While skillet is heating at low.. On a flour dusted board, divide the dough into 6-7 small portions. Dredge each ball in dry wheat flour to avoid sticking to flour dusted board or hands. Roll each ball to 2-3 inch circle. Place 2-3 tbsp or small tennis ball size potato stuffing in the center. 4. Fold the filling in dough and close it like you make a dumpling. Flatten it little bit with palm. 5. 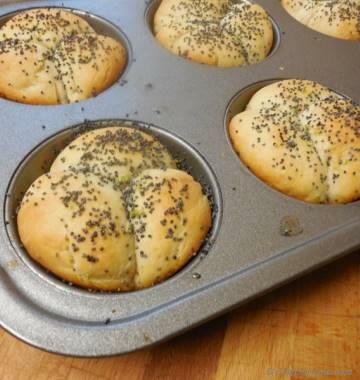 Roll the stuffed dough ball to make flat bread of about 6 inches diameter. Place the flat bread on heated skillet, let it cook from bottom for 1 minute. 6. Flip, spread 1 tsp oil on surface and then flip again. Apply oil on now up side too. Sear each side for 2-3 minutes. Press with flat spatula for even cooking. Paratha is ready when it has brown fried spots all over surface. Remove fried paratha on plate lined with paper towel. Repeat step 4 to 6 for remaining parathas. Stephanie, that sounds really good. Please do try!